Aaimir Hussain, MD, is a board-certified radiation oncologist who is on the front lines of the battle against cancers of the central nervous system, lungs and genitourinary tract. A leading provider of stereotactic radiosurgery and stereotactic radiotherapy, he helps patients diagnosed with brain and spinal tumors as well as those with prostate, breast, lung, urologic and gastrointestinal cancers. Patients across Central Florida may be referred to his care for all manner of soft-tissue sarcomas, bone cancers, breast cancer, melanomas and other skin cancers, Hodgkin’s and non-Hodgkin’s lymphoma, and other complex conditions. 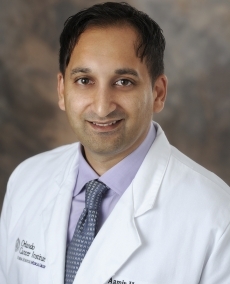 Dr. Hussain earned his medical degree and undertook his internship training at the Mayo Clinic before going on to the UCLA Medical Center for his residency training in radiation oncology, finishing there as Chief Resident.